Time to cut down on your late-night TV show marathons. Being perpetually puyat is the worst thing ever. If you’re one to never get enough shut-eye, then you probably know that constantly doing so doesn’t only lead to ugly dark circles and bags under your eyes. Other effects include horrible mood swings, junk food cravings, slow metabolism, and dull and dry skin. Sleep can minimize wrinkles and fine lines. Your body produces new collagen when you sleep, making your skin plumper and less prone to wrinkles and fine lines. Only getting five hours of sleep a night can lead to twice as many wrinkles as sleeping for seven hours would! Sleep can give you a healthy and youthful glow. Ever wondered why your skin doesn't look so good the morning after an all-nighter? Lacking sleep can reduce the blood flow to the skin around your face, making your cheeks dull. Sleep can boost blood flow to the skin, promoting cell renewal and giving you a rosy, healthy glow. When you start sleeping better—preferably with an extra pillow to elevate your head and reduce the swelling of your skin—your pretty peepers will become brighter and your face will look less tired. Dermatologists say anti-aging products work best while you're asleep since they augment the skin’s natural rejuvenation process. 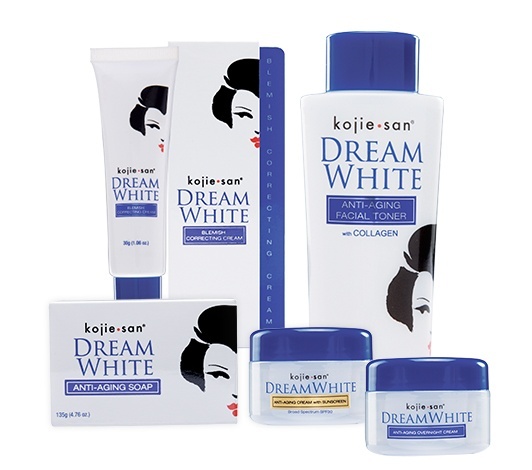 Go all out with your skincare before you call it a day with kojie.san’s DreamWhite line, which works to hydrate, revitalize, and lighten your skin as you sleep, helping you get the most out of your beauty rest so you wake up looking more radiant, fresh, and youthful. kojie.san DreamWhite Anti-Aging Soap combines the youth-regenerating properties of Collagen and Elastin with the whitening effect of Kojic Acid, prepping the skin for a night of rejuvenation. kojie.san DreamWhite Anti-Aging Facial Toner pampers your skin with Marine and Botanical Extracts that moisturize, tighten pores, and promote firmness. kojie.san DreamWhite Overnight Cream further hydrates and nourishes your skin with its youth-regenerating Milk Peptide Complex (MPC), plus smoothening skin conditioners that help manage skin imperfections. Finish your anti-aging nighttime ritual with kojie.san DreamWhite Anti-Aging Blemish Correcting Cream to exfoliate and whiten stubborn dark spots, and make sure your glow lasts the next day by using kojie.san DreamWhite Anti-Aging Cream with Sunscreen. With such a good nighttime beauty regimen, you'll get back your #WokeUpLikeThis glow in no time! Visit Kojie.san DreamWhite's Facebook and Instagram pages to know more. This article was created by Summit Storylabs in partnership with kojie.san DreamWhite.